During Thursday night's Democratic debate, Hillary Clinton was asked to address Madeleine Albright's comments that there is "a special place in hell for women who don't help other women," which has been trotted out during this campaign and recently framed as a pull for women to vote for the candidate. Although this gave Clinton an opportunity to address the quote in terms of her campaign, she largely avoided answering the question and steered the conversation toward women's rights. Unfortunately, this means that the misperceptions around the quote will remain. 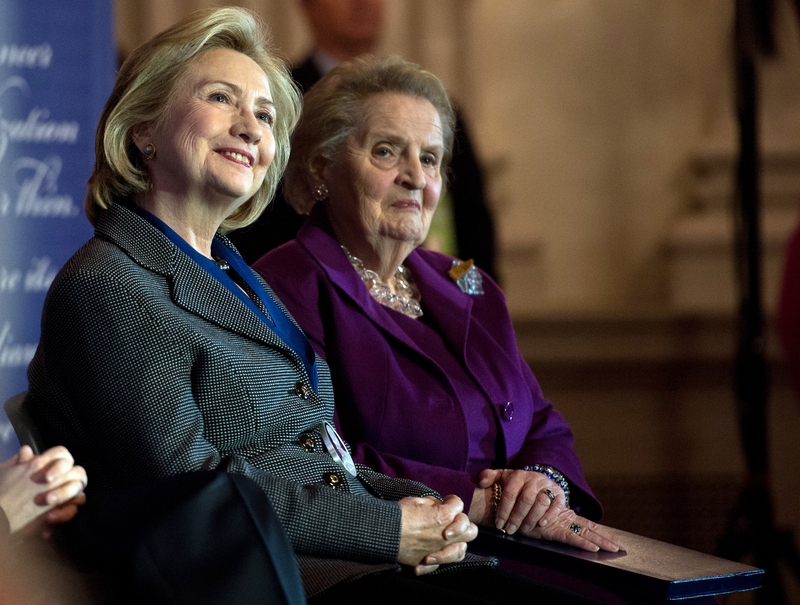 On Saturday, Albright — who was the first female secretary of state — made the very public declaration, fueling a string of attacks against both Albright and Clinton for prompting women to vote for her just because they are women. But this isn't a new line from Albright: She's been saying it for four decades. After Clinton briefly explained that Albright has been saying that "for as long as I've known her" — which is a while, considering that Albright was the secretary of state under Bill Clinton — she began to not-so-subtly avoid the question. (She did, however, get this solid gold line in: "We've had something like 200 presidential primary debates and this is the first time we've had a majority of women on stage," referring to herself and the two female moderators.) Although it's a little frustrating that the American public apparently has the memory of goldfish (c'mon people, it was on a Starbucks cup! Even Taylor Swift knows it! ), Clinton probably would've benefited by taking the question head on. In the days since Albright, who is supporting Clinton's presidential campaign publicly, trotted the line out again, Clinton has come under fire from people such as Bernie Sanders' wife, who called the comment "unfortunate and disturbing." That fed into the narrative that Clinton was telling women that voting for Sanders meant that they were going to be damned to hell, which takes the quote completely out of context. Albright has traditionally applied her own words to workplace politics and female leadership, meaning that women need to be lifelines to each other. In this case, it doesn't mean that Albright thinks that any woman who doesn't decide to vote for Clinton should spend an eternity in a special place beside Satan (or whoever). It meant that women should continue to focus on women's rights in this election, not just letting women's issues fade into the background as they so frequently do in politics. In Albright's clear opinion, the best candidate on those issues is Clinton. But she's not going to hold you to the fire if you disagree and believe Sanders would do a better job: Just as long as you're thinking critically.